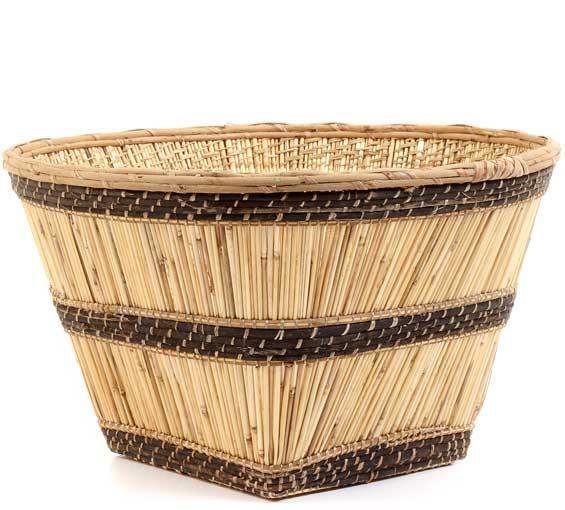 This all-natural storage basket comes from Burkina Faso. Made of reeds, it is lightweight, yet very sturdy enough to hold your heaviest quilt. The Mossi people from the Sanmatenga Province of central Burkina Faso construct these interesting baskets in black (Penéiga), natural (Péraogo), or striped designs (Pégangué-Yonké). These deep baskets are used in ceremonies, primarily weddings, and are also used for collecting cereals during harvest. Woven from very strong reeds, these baskets are lightweight but sturdy. Use as a rustic display basket, for storage, or even as a recycling bin.